Family Tech: The battle of the living room. The battle of the living room is a tense one. So who owns it? Now, depending on who you speak to in the household, ‘they’ own the living room! Although the kids are probably the main occupants of the room, it’s the parents who set it up – and more specifically, research has showed that the Mum’s tend to be the ‘gatekeeper’ of the living room. Christmas is on it’s way (already! ), the adverts have started on the telly and the battle of the consoles has commenced! With PS3’s and Nintendo 3DS’s already reducing their prices to be the gift this Christmas, I really don’t think it will be enough to compete with the XBOX and it’s Kinect. Nintendo were the first console to have the interactive play with the popular Wii, but Microsoft improved on that and with their Kinect, they’ve stolen a good proportion of the market from Nintendo. Over the years, the XBOX has always been more appealing to a male audience and more specifically, the teenage male audience. At one point, I thought they were so far away from cracking the family market, that Nintendo had it sewn up for years. This wasn’t to be the case. With the release of Kinect at the end of 2010, they proved they were very much in the running for best family console. Playstation released their ‘Move’ but with Kinects controller-less abilities, it was obvious what was going to come out top and it did. 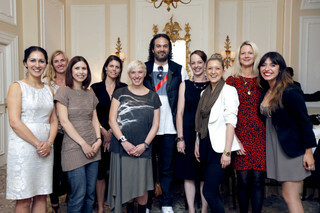 Thanks to Lady Geek, I was given the chance to meet Kudo Tsunoda, Creative Director of Kinect, who was ‘grilled’ by a room full of Mums – who I have to say, dealt with barrage very well. Kinect seems to have have been recieved well with the group of Mums and so, if the feedback given to Kudo and his team is taken on board by Microsoft, I think Kinect will be a force to be reckoned with in the family gaming stakes. My biggest issue with Kinect currently is the lack of Family Pack as standard. In my opinion, it’s clear that the Kinect is a family targeted and should come with the Family Pack as standard. Kudos to Microsoft, they’ve done a great job with Kinect. I think we’ll see this Christmas will be a triumphant one with some fab games being released for Kinect. Previous Previous post: Music to your ears!